The weekend had it's ups & downs. The smoothie and soup project is proving more difficult than I expected ... there seems to be an awful lot of preparation before you get to actually blend a soup. Pout. 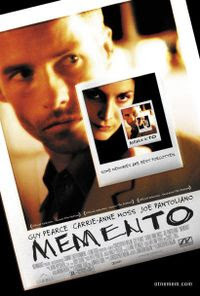 Memento is a neo-noir–psychological thriller film written and directed by Christopher Nolan, based on his brother Jonathan's short story "Memento Mori". The film stars Guy Pearce as Leonard Shelby, a former insurance fraud investigator hunting for his wife's murderer. During the attack on his wife, Leonard suffered severe head trauma and lost the ability to make new memories. To cope with his condition, he keeps a collection of notes, photographs, and tattoos to remind himself of people, places, and events he cannot remember. He is aided in his investigation by "Teddy" (Joe Pantoliano) and Natalie (Carrie-Anne Moss), neither of whom Leonard can trust. Then we went out and bought more fish ... well, 2 new koi for me. I decided the other's needed some friends and the bowl is certainly big enough. Unfortunately one has gone the way of the toilet already :( Varen got very fancy and got some new fish and filters, pumps, lights and other fish-tank paraphernalia. After that, I went home to introduce the new additions and begin my smoothie experimentation. Then on Sunday, after more House, we went and lazed at the Walter Sisulu Botanical Gardens for the afternoon. I love that place, it's so relaxing, if you can get past all the screeching kids ;) And then we dashed off to Rosebank to watch Stranger than Fiction. Harold Crick (Will Ferrell) is a droll auditor in an unnamed city (actually Chicago) for the Internal Revenue Service who is awakened alone each morning by his Timex T56371 watch. He eats alone, counts the number of steps he walks for fun, focuses on ways to save time tying his tie, and brushes his teeth exactly 76 times (38 vertical strokes, 38 horizontal). One day, Harold begins to hear the voice of a British woman (Emma Thompson), describing his thoughts and actions in real-time as if he were a character in a book. Harold attempts to communicate with the speaker, but soon realizes the voice does not know that he can hear it. His bewilderment soon turns to anxiety when the voice narrates that his watch has set in motion a series of events that will result in his imminent death. I thought it was fab. I enjoyed it more that The Truman Show - which it has regularly been compared with. I thought it was more like Kaufman's Adaptation, which I enjoyed immensely and far more than Being John Malkovich. And that was pretty much the weekend, without all the emotional up & down removed. I spent some time going thru pictures that I need to get printed ... from my holiday in Egypt with Bean last June. And then I ended up upset and angry with him. And then there is the bizarre state of my relationship with Varen right now. We seem to have some lovely moments when it's an absolute pleasure to be around each other and then there are moments when we just irritate each other and get annoyed and frustrated. And now you have the up-and-down bit of the story too.